The course of world politics is determined by the interaction between the Great Powers. Is Europe one of them? Russia intervenes in Syria, the US withdraws from the INF Treaty, China pursues its Belt and Road Initiative. Where is Europe? 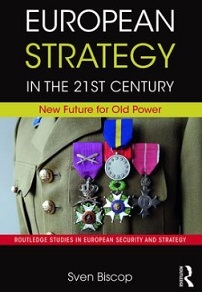 In a world of Great Powers, the European Union has no choice but to act as a Great Power itself, or it will become the theatre in which the competition between the other Powers plays out – which is happening already.In his new book, European Strategy in the 21st Century, Sven Biscop seeks to demonstrate that the EU has the means to pursue a distinctive Grand Strategy, and can play a crucial stabilizing role in this increasingly unstable world. The book will be available in December 2018. Pre-order now using the code SOC19 and receive a 20% discount: only £23.99 for the paperback. Prof. Dr. Sven Biscop obtained his degree in Political Science at Ghent University (Belgium) in 1998, winning the best thesis award for his work on European defence. Subsequently awarded the Paul-Henri Spaak PhD scholarship of the Fund for Scientific Research – Flanders, he defended his dissertation in Ghent in 2002, published as Euro-Mediterranean Security: A Search for Partnership (Ashgate, 2003). Currently Sven is the Director of the Europe in the World Programme at the Egmont – Royal Institute for International Relations in Brussels, which he joined in 2002, and a Professor at the Ghent Institute for International Studies (GIIS) at Ghent University. His research and teaching focus on the strategies of the European Union, NATO and their Member States. In 2015, on the occasion of its 10th anniversary, Sven was made an Honorary Fellow of the EU’s European Security and Defence College (ESDC). He regularly lectures in its courses, as well as in various European and American staff colleges, and at the People’s University of China in Beijing, where he is a Senior Research Associate of the Centre for European Studies. Sven also is an Honorary Member of the ESDC Alumni Association and a Senior Associate Fellow of the Austrian Institute for European and Security Policy and of the Baltic Defence College. Sven chairs the jury of the annual Global Strategy PhD Prize awarded by Egmont, the ESDC, and the EU Institute for Security Studies. He represents Egmont in the Higher Studies in Security and Defence, a course for security practitioners organized with the Belgian Royal Higher Institute for Defence. With Richard Whitman, Sven co-edits the European Strategy & Security book series for Routledge; and with Knud Erik Jorgensen he co-edits Global Affairs, the journal of the European International Studies Association (EISA). He is the editor-in-chief of Egmont’s journal Studia Diplomatica and its Egmont Papers, and a member of the editorial board of the journals European Security (UK) and The International Organisations Research Journal (Russia). Sven’s latest book is Peace without Money, War without Americans – Can European Strategy Cope? (Ashgate, 2015). In 2017 he was awarded the order of merit of the Republic of Austria (Grosses Ehrenzeichen für Verdienste). Born in Willebroek (Belgium) on 10 February 1976, Sven now lives in Brussels with his husband Aberu, amid a great many books, military paraphernalia, and chinoiseries. Unfortunately, they travel too often to keep a cat. As part of the 2017 edition of the PONT Career Skills Training, Sven Biscop conducted a class on “how to write a policy brief”. Find out more about PONT at: http://www.tepsa.eu and watch the video on Youtube.